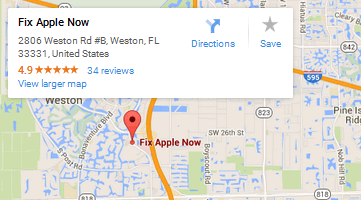 Below you can find driving directions from Google Maps to help you get from Medley to your nearest Fix Apple Now store, situated in Weston. You can either copy the driving instructions below or click here for a larger map and driving directions. Talk to Fix Apple Now today if you need to fix your Apple device in Medley. Whether you've experiencing problems with an iPad, iPod, iPhone 4,5 or 6, iMac or Mac Mini, we can help. Our engineers are amongst the most skilled in the business and always aim to get right to the very bottom of your problem to solve it permanently. Maybe you need to fix a bent iPhone 6 Plus, a cracked screen or broken camera? Perhaps your Bluetooth isn't working, or you can't hear during calls? Whatever the case, you can count on us to fix your device quickly and return it to you within just a couple of days. We know how much our customers need their devices, which is why we always endeavour to reach the best possible outcome quickly. We also offer some of the most competitive prices on the market. Why not talk to us today if you've been looking for Apple device repairs in Medley? Get in touch today.